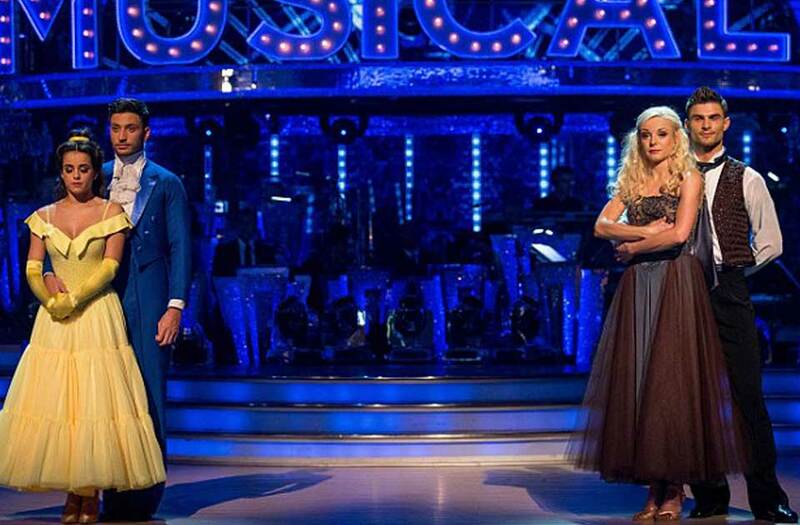 Strictly fans were tres-Mis last week as Helen left in a Strictly in a shock exit ahead of the semis. Last Sunday's Night's Strictly dance-off came as a big shock when Helen George (Call the Midwife) left after a dance off against dynamic duo Georgia and Giovanni and the final will undoubtedly lose some of its sparkle without her. Helen's unique blend of passion, talent and self-effacing charm will be hugely missed. Her Strictly highlights featured a flirtatious salsa dressed in a nurses uniform which revealed gazelle-like legs combined with tigress intent She shimmied, gyrated and sashayed with abandon and performed gasp-inducing splits bringing her formidable Latin abilities to the fore. Meanwhile the quickstep showcased her ballroom best, suiting her lightness of being, looking totally effortless and oozing Hollywood style. Compare this with this week's opening and Katie's lacklustre Charleston and it seemed that Strictly was on the downslide to Drearyville. Especially when it materialised that poor Georgia had pharyngitis, concerning viewers that she too, might have a croaky performance. Anita's salsa had about as much authenticity as a packet of Doritos but was still oddly watchable and just as more-ish due to her fearlessly feisty attack. Despite Kelly's best efforts at the Rumba there was not a glint of romance or hint of seduction to fire the audience's applause and rouse them on their feet. To use a Len-like analogy, Strictly this week was like mulled wine which had gone off the boil. But after some shenanigans with Claudia in a dolphin costume, the show started to heat up at long last. Georgia and Giovanni's waltz provided pure Madagascan Vanilla warmth, whilst Jay and Aliona added their own citrus twist; their Charleston was worthy of a it's own episode of Doctor Who - Jay owned it with such style and aplomb that the dazzling Aliona was reduced to the role of his 'companion'. It has the swivel and essence of a 1923 Charleston with a modern finesse of it's own. As Claudia said, with a touch of Ginger from the back of the spice cupboard in the form of Kellie and Kevin, something magical really started to happen. Kelly Bright's American Smooth was warm and delicious; she appeared to take off on her Maribou feathers and fly around the floor, with her flirty sideways glances at Kevin finally infusing her performance with sugar and spice, without being saccharine. So who will avoid 'extermination' this week? Only tonight will tell.